September is the time for many Florentine and Tuscan events and festivals. 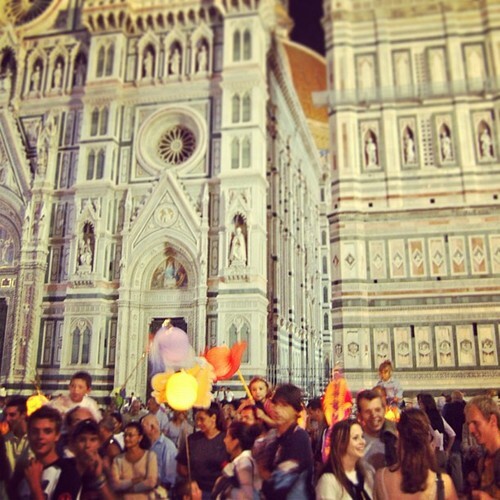 One of our favorite nights of the year here in Florence is the "Festa della Rificolona", an evening parade through the streets of Florence, with children carrying paper lanterns lit with candles, while other children shoot the lanterns with pea shooters! (In the modern version these "pea shooters" are hollow metal cylinders and the "peas" are tiny balls of clay or spitballs) The festivals origins are not exactly clear or agreed upon. More probably the Festa della Rificolona grew out of the great fall market held September 7 (the day before the Nativity of the Virgin) in Piazza Santissima Annunziata. It was perhaps the most important market-day of the year, because it allowed the farmers to gather cash for the coming winter: To arrive early those living in the outlying regions would shoulder their packs long before dawn and carry lanterns, made by suspending candles within tissue-paper wind-shades, to light their way. Entire families would come, dressed in their Sunday best, but they were ignorant county folk and their attempts at elegance only made the city people laugh (Florentines still call an overdressed, over made-up woman a rificolona). Children would blow whistles at them, and make their own lanterns with colored tissue paper to follow along, or shoot at the farmers' lanterns with blowguns, in an attempt to knock over the candles and set the tissue paper ablaze. It probably dates from the mid 17th century when country folk travel to the city from distant areas on the eve of the Feast Day, congregating in the square in front of the Basilica of Santissima Annunziata. They naturally brought their wares, giving rise to a market that coincided with the celebrations in the Basilica when the entire city came to worship the miraculous image of the Annunciation. They often had to start out at night or at the crack of dawn to find a good site for their stalls, guided by the wavering light of paper or canvas lanterns, tied to sticks or poles. The parade and ending night festival is on September 7th of each year (which is also the Feast of The Madonna), starting in the Pizza Santa Croce and ending up in the Piazza Santissima Annunziata, with a band leading the way.